Child care is not a luxury for American families—it’s a necessity. Yet the costs associated with quality child care are rapidly outpacing other expenses faced by families, including the cost of higher education. In addition to other important federal programs that support the care and education of America’s young children from birth through age five – particularly those from low-income families – the Temporary Assistance for Needy Families (TANF) program plays a crucial role in offering relief to these families for their child care expenses. TANF helps states to break the cycle of poverty through quality early childhood programs that support children’s development, while allowing parents to enter or return to the workforce. The TANF program is designed to help families living in poverty achieve self-sufficiency. 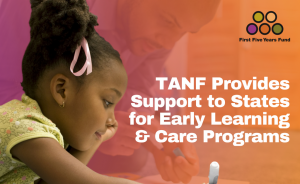 States receive funding to develop programs and opportunities that accomplish one of the purposes of the TANF program, including a broad range of child care and early education initiatives. As Congress considers reauthorization of TANF, there is a significant opportunity to recognize the unmistakable role quality early childhood experiences play in helping to break the cycle of poverty. Learn more in our latest resource on child care and TANF.